I love all types of makeup and it has become one of my favorite things to research, purchase, and wear. For the longest time the only thing I cared about was mascara and eye shadow. Lipstick has always been a staple in my life, but I’ve never really understood how to properly apply makeup, let alone make myself look presentable. Probably a year ago I discovered a few different youtube channels that unlocked the world of makeup for me. Eventually I will do a post on my favorite channels so we can all be makeup pros together. With my newly found skills and wisdom I now feel competent enough to sport a full-face of makeup, but I don’t have the time and motivation for it everyday. Luckily, with the right combination of light skin coverage, some mascara, lip stick, and a good eyeliner you can look very polished with minimal effort. 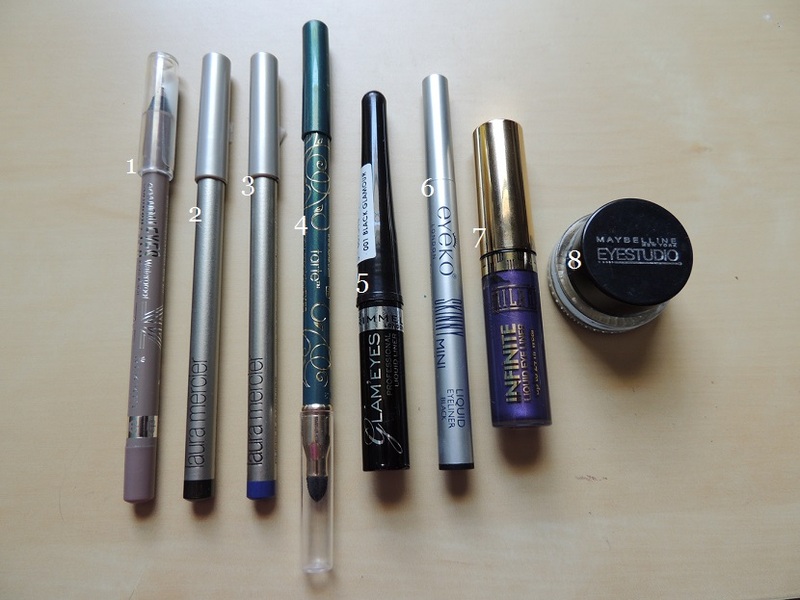 I’ve put together my favorite eyeliners that can make a world of difference and can take next to no time to apply. You may be better at applying stick liners or you’ve never tried a gel liner, but it’s all easy! 1. Rimmel Scandaleyes Waterproof Kohl Kajal in Taupe 004. This is a really good drugstore liner with a great range of colors. It goes on very smoothly and in this shade it will brighten and open up your eyes but still keep your look neutral. I prefer to use this on my waterline to finish off a smokey eye, but this is a good liner alone as well. 2. Laura Mercier Kohl Eye Pencil in Black Gold. This color is just lovely. It isn’t too gold, but isn’t too dark either. It is a very soft metallic which is also sweet to put on the waterline when doing a smokey eye. This color especially makes your eyes pop when put on the lash line. I have to say I was a little disappointed that, for the amount I spent on this liner, the staying power isn’t quite what I would have hoped for. That being said, it does glide on very easily even over eye shadow. 3. Laura Mercier Kohl Eye Pencil in Purple Sapphire. I’m not sure if the formula is different for this color, but this eye pencil is much longer lasting than the Black Gold shade. The pigment of the Purple Sapphire is wonderful, but it does not apply as easily as the Black Gold, so there is the trade-off within the Laura Mercier brand. Either way, this is a great way to bring a pop of color to a very simple look, just add cream blush, lipstick, and mascara and you’re good to go! 4. Tarte Skinny SmolderEYES in Emerald. Tarte is quickly becoming one of my favorite brands. At Christmas time last year I bought their Christmas palette which is FULL of amazing products for a reasonable price. I’m excited to see what they have to offer this year. My initial search the day I purchased this pencil was for a nice cobalt pencil, but when I picked this up and swatched this emerald I had to have it. The easy manner in which this glided on and the color pay-off were unbelievable. I have worn this multiple times and have accidentally wiped my eyes (more times than I’m proud of) and never lost any product by wiping! The smudger on the other end of this stick is also very handy. I highly recommend this product, I’ll be buying more of these liners. 5. Rimmel Glam’Eyes Professional Liquid Liner in Black Glamour. The skinny tip on this liquid liner can help you create any type of look you desire. It especially helps makes creating a dramatic line very easy- the skinnier the brush the easier it is to add on. This is only offered in black, but as a drugstore product this is really reasonably priced and the quality is good! I find it is much harder to go wrong with a liquid liner than it is with an eye pencil so a drugstore product will give the same results as a high end product in this situation. 6. Eyeko Skinny Liquid Eyeliner in Black. To be honest, I received this product in a birchbox. I had no idea how much it cost until I looked it up today. This is definitely a product I would purchase though! After I finish up the sample I received I will be buying this again online! 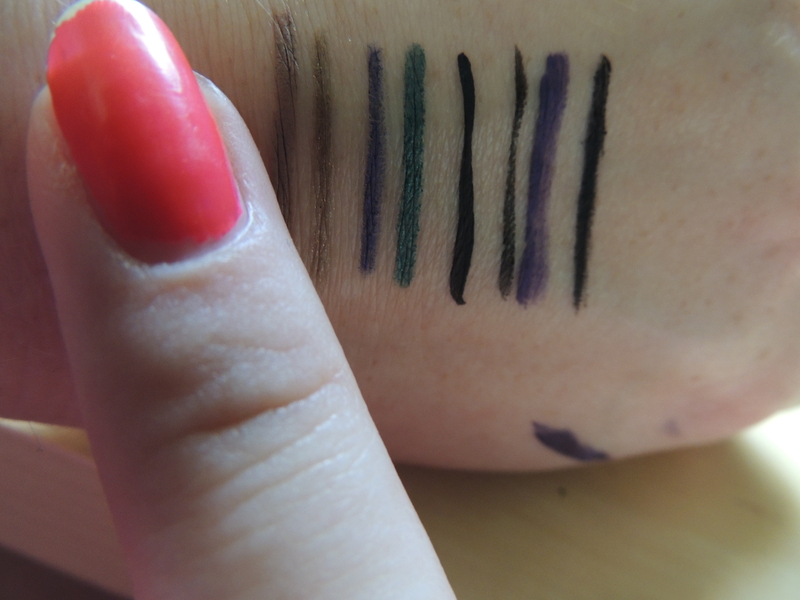 The Skinny Liquid Eyeliner is even easier to apply than Rimmel’s Glam’Eyes. This comes in a pen form and may drag a little on the lash line as applied, but is skinny enough to build up and create a perfect, easy line. I am excited to try other products from this brand. 7. Milani Infinite Liquid Eyliner in Endless. I bought this in an attempt to bring more color to my face when I’m wearing a basic look. 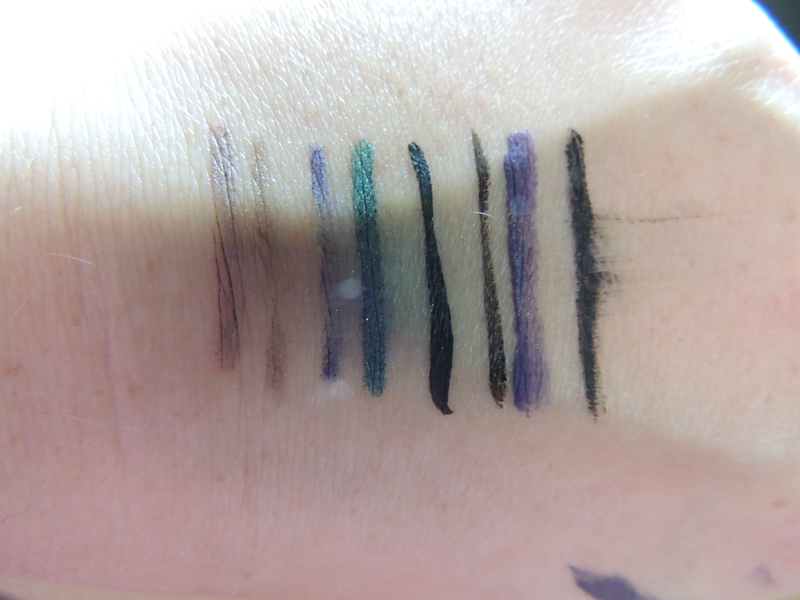 The pigmentation and staying power is of this liner is impressive. You can buy Milani products in most drugstores as well, so the price is right! I would say the only disappointment of this product is that the brush is a little hard to manage. It is longer than I would prefer and applies more thickly than a normal liquid liner, but with a steady hand it can look stunning. If you’re adventurous this looks great as a partner along the top of a basic black line. 8. Maybelline Eye Studio Lasting Drama gel liner in Blackest Black. I bought this on a whim in Walmart once and I’ve been hooked ever since. 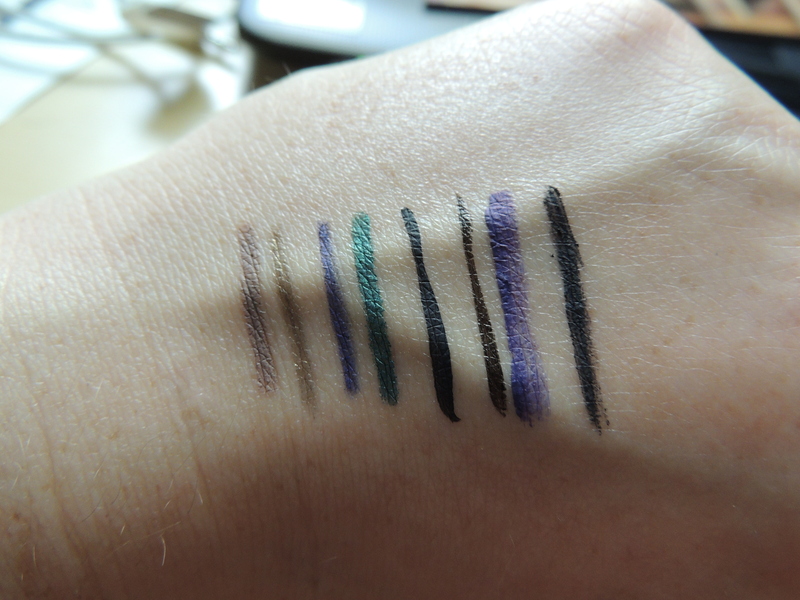 I have a predisposition to love Maybelline products, but this liner has really impressed me. The liner comes with a brush, but I prefer to use an angled liner brush to apply which makes doing any look, even a cat eye, very easy. It applies nicely over shadow, creates a clean line, and lasts a really long time without drying out! Of course you shouldn’t keep products for too long for… health and safety, but this will last you as long as you keep the lid screwed on tight! Please excuse the chipped nails, but I swatched each product and ran my finger over them to show how well they last after application. They are in order on my hand as they are listed above. Exploring Europe with Hermione's wits, Harry's curiosity, and Ron's budget.